If you’re embarrassed about your smile because of decay or dark fillings or you just want more natural looking teeth; you may be a good candidate for composite resins. Until recently, dentists only had available the silver amalgams to fill cavities. 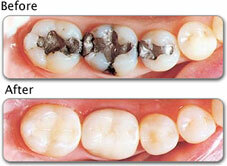 Recent innovations now allow us to replace these old fillings with composite that are more natural looking. Say goodbye to “metal mouth” and hello to a beautiful new smile. Composite fillings are a mixture of glass or quartz filler in a resin medium. Composite fillings provide good durability and resistance to moderate forces. Some forms of composite, called glass ionomers, release fluoride for filling areas near the gum-line or for children’s fillings. They are less durable and can not be used in posterior teeth. Composites can be “bonded” or adhesively held in place, therefore less tooth structure is removed, allowing the dentist to make a more conservative repair to the tooth. This may result in a smaller filling than that of an amalgam. It generally takes longer to place a composite filling than what is required for an amalgam filling. Composite fillings require a cavity that can be kept clean and dry during filling and they are subject to stain and discoloration over time. Composite resins can restore teeth to an attractive, healthy state.